After extracting your package, Calamari will detect these scripts and invoke them. Which file you use depends on when you need your custom activity to run – see the section on what order are conventions run in for details. Your scripts can do anything your scripting language supports, as well as setting output variables and collecting artifacts. These scripts must be located in the root of your package. As mentioned above, you can create a file named DeployFailed.<ext>, which will be invoked if the package deployment fails. Our blog post about this feature describes how DeployFailed. works. As of 4.1.10, you can prevent the running of scripts in packages by adding the Octopus.Action.Package.RunScripts variable to your project (scoped as needed) and setting it to false. Make sure that the scripts are included in your package. 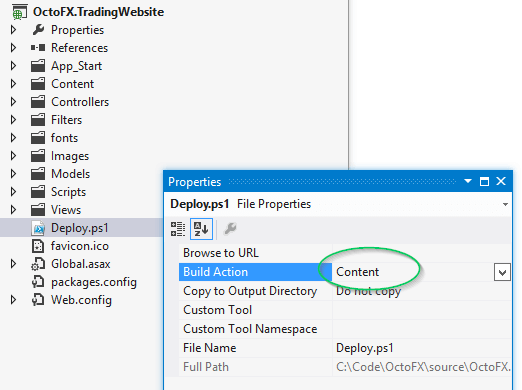 If you are using OctoPack for an ASP.NET web application, you'll need to make sure the file is marked as Build Action = Content. 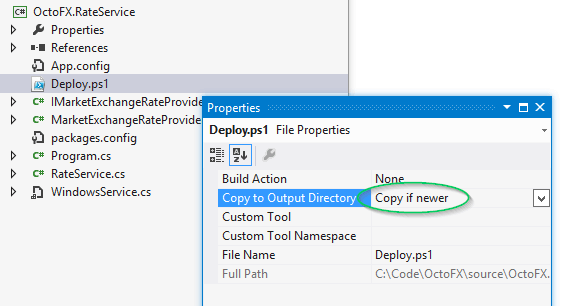 If you are using OctoPack to package a Windows Service or console application, set Copy to Output Directory = Copy if newer. Read more about using OctoPack. Rather than embed scripts in packages, you can also define scripts within the package step definition in Octopus. This is a feature that can be enabled on package steps by clicking CONFIGURE FEATURES and selecting custom deploy scripts. When enabled, you will see Configuration Scripts under the features section of the process definition.